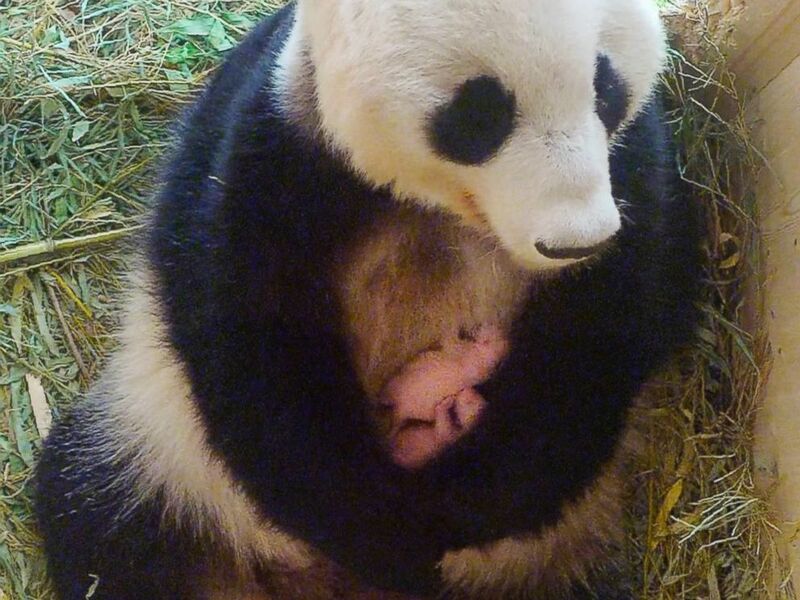 A giant panda has surprised the Schönbrunn Zoo in Vienna, Austria, with twins after zookeepers found an extra cub they said they didn't see when she originally gave birth. 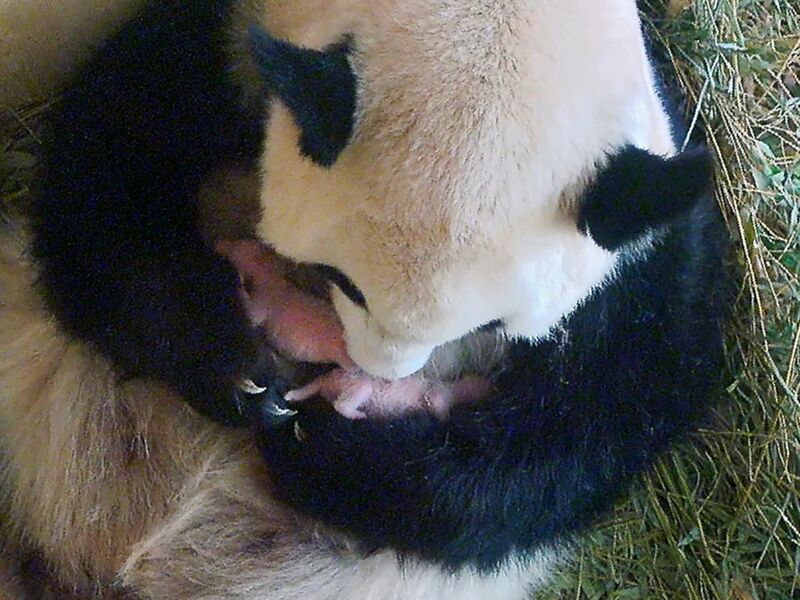 The zoo announced last Monday, Aug. 7., that their mama panda, Yang Yang, had given birth to one cub. But keepers soon became suspicious after hearing what sounded like the squeaks of not one, but two baby pandas coming from the breeding box. Those suspicions were confirmed on Friday, Aug. 12, when Yang Yang was caught on camera cradling twin baby pandas, the zoo said in a news release on its website today. Because the zoo believes in natural rearing, keepers had only been monitoring the pandas via camera, Dagmar Schratter, the zoo's director, explained in the news release. "It had sounded as if there were two young animals squeaking, but the pictures only ever showed one," Schratter said. But on Friday "keepers could see two babies on the screen for the first time." This handout picture taken on Aug. 15, 2016, by the Tiergarten Schonbrunn zoo in Vienna, shows a video grab of panda mother Yang Yang holding her twins. Though it's common for giant pandas to give birth to twins, the mother usually only rears the stronger of the two, the zoo said. Additionally, the survival rate for pandas in their first few weeks is only 50 percent, so the zoo said it will name the new pandas only after they've lived past 100 days -- per Chinese tradition. But both the newborns appear to be doing very well at the moment, the zoo said. "Both pups have little fat bellies and mother panda Yang Yang is very relaxed," zoologist Eveline Dungl said in the zoo's news release. A frame from a video camera of panda mother Yang Yang holding her twins at the Tiergarten Schoenbrunn zoo in Vienna, Aug. 15,2016.The two baby pandas were born at the zoo on August 7, 2016. "The little ones can be rarely seen on the pictures because Yang Yang warms them between her large paws most of the time," Dungl added. And though pandas are born pink and without fur, zookeepers said they're already noticing black and white fluff growing on the babies. If all goes well, visitors will be able to see the twins when they reach about 4 months of age, the zoo said. 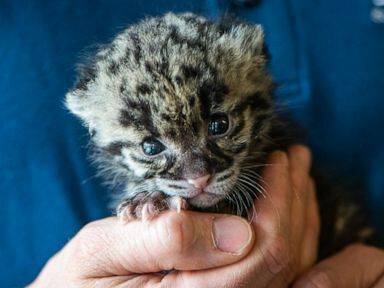 Until then, the zoo will be regularly posting new photos and videos on its website and social media.